Day old chicks, ducklings, turkey chicks, goslings, hatching eggs, and poultry feed available to ship nearly year-round, expertly packaged and safely shipped anywhere in the contiguous United States. Additionally, we have a small minimum order quantity of just 3 ducklings, chicks, or goslings. Browse our wide selection of chickens for sale, ducks for sale, turkeys for sale, game birds for sale, and adult ducks for sale. 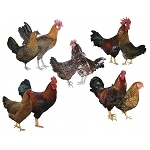 We also offer hatching eggs, poultry feed, and poultry supplies. All breeds are sent from the highest quality flocks with a safe arrival guarantee. Want to learn more about raising your backyard flock? Check out our backyard chickens blog for tips and guidance to raise your chicks, ducklings, goslings, and more! Please feel free to comment and leave feedback on our blog.